"Ayushmann Khurrana, you are a gem. Much love to you, man!" read a comment on the Badhaai Ho actor's Karva Chauth-special tweet. On Saturday, the 34-year-old actor tweeted a photo revealing the mehendi pattern he recently got done for Karva Chauth - "T=Tahira", he wrote on a photo. Ayushmann Khurrana is married to Tahira Kashyap, who was recently diagnosed to be in a pre-cancerous state. On his Instagram story, the actor also revealed that he kept the Karva Chauth fast this year owing to his wife's medical condition and wrote: "She can't fast this time but I will. For her good health and long life." Ayushmann Khurrana and Tahira Kashyap married on 2011 and the couple are parents to two children - son Virajveer and daughter Varushka. 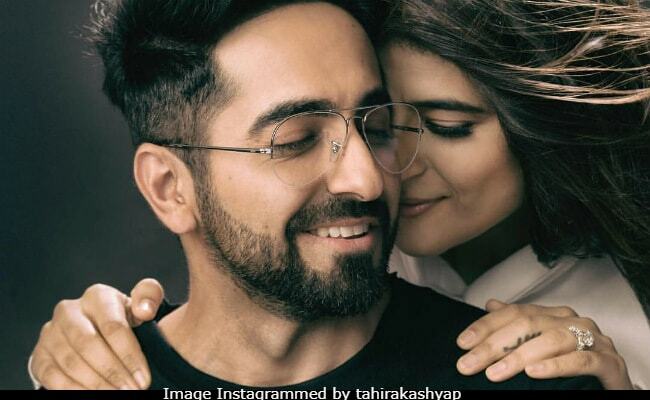 Richa Chadha, who was one of the first ones to comment on Ayushmann's tweet, gave a massive shout-out for his sweet gesture and wrote: "Cutest," but she's definitely not the only one who cheered for the actor and wished for Tahira's good health. "You guys are so beautiful. God bless you with good health and love and happiness," read a tweet while another added: "God bless you both." Several tweets also singled out Ayushmann for setting major relationship goals: "Ayushmann you are the perfect role model for men today! Bless you!" wrote a user while another said: "Role model." Ayushmann you are the perfect role model for men today! Bless you! Earlier in September, Tahira shared she's underwent treatment after being detected with pre-cancerous malignant cells in her breast: "I was detected with DCIS (ductal carcinoma in situ) in my right breast with high grade malignant cells. Simply put stage 0 cancer/ pre-cancerous stage, with cancer cells multiplying in a contained area. The result I have become a half Indian version of Angelina Jolie (since only one breast was involved)! I told my doctor now is the time to give some competition to the Kardashians since Pamela is passe. But no one listened to me, so now I have a portion of my back tissue in my breast," read an excerpt from her post. On the work front, Ayushmann Khurrana is currently basking in the glory of the success of his new film Badhaai Ho. Ayushmann's previous film Andhadhun also opened to much critical acclaim and impressive box office numbers.